Otar Tsiskadze is a less famous translator who translates foreign - mainly Russian and English - authors into Georgian. He is unique for his translations of Lord Byron. There are only a small portion of Byron’s poems that are translated into Georgian. 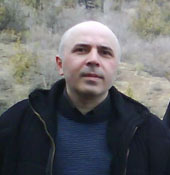 Otar already has 63 translated poems of the author. His works are highly assessed by professionals and critics. However, due to the lack of finances, the Ministry of Culture refrains from publishing the translations. The Messenger sat down with Mr. Tsiskadze to speak about the problems he faces. M: When did you start translating activities? O: Initially I was writing my own poems and then I tried myself in translation. Initially I translated several sonnets of Shakespeare and gradually I refined my own approach and methodology. During the working process, I was familiarizing my works with professionals in the field of literature like Ph.d Gaga Lomidze, Professor Manana Gelashvili, Poet Koba Chumburidze and others. When I sent them the latest version of my Shakespeare and Byron translations they gave them high assessments, saying that I promoted much for Georgian-English literature as Georgia lacks high-quality translations of English Romantics. M: Why is Byron so rare in Georgian? O: He is a very diverse poet, and translating his works requires much effort, energy and talent. M: What was the response from the Ministry of Culture when they submitted your works? O: Initially I sent the works to Deputy Minister of Culture Manana Berikashvili. However, as Berikashvili could not estimate the works owing to the lack of knowledge of English, my works were handed to Irine Tchoghoshvili. She wrote me that my works were excellent and she personally liked them very much. Nevertheless, the ministry had no finances to publish them. She informed me that a new institution was being created that would be focused on translations. However, I am less optimistic, as the Ministry mainly supports those who are more famous. M: Have you addressed any private organizations? O: Yes, I have addressed several of them. They stated that I needed promotion that requires much finance on hand. M: How do you make your translations? O: I use all the existing materials to guess the commonsense of a poem. 90% of my Georgian version meets its original. I make translations at work as well, as I have not such privilege to sit at home all the time and translate. If I had more assistance, I would make more translations of not only Byron and Shekspate, of other English authors, which are not translated into Georgian.